As a result of Sullair Air Compressor's rugged, time-proven design, the Variable Capacity Control or VCC requires only minimum maintenance for optimum performance. There are no troublesome belst or expensive bull gear arrangements to wear out or to replace. 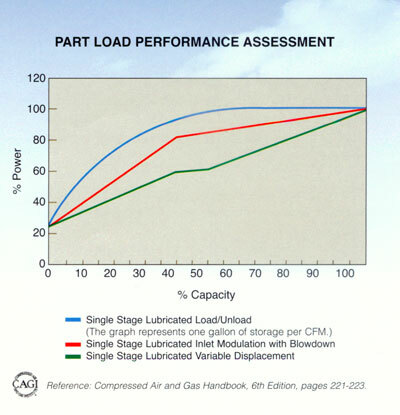 The chart at right shows how a Sullair rotary screw air compressor with variable displacement reduces power consumption as the air compressor load drops. More importantly, it illustrates the substantial power savings at part-load when compared to other capacity control systems. Ring Power is a leading supplier of air compressors, air tools, compressor parts and air compressor service in Florida for over 45 years. Our offices service the Miami and Pompano Beach, Orlando, Tampa, Jacksonville and Tallahassee areas. We carry electric and diesel and industrial air compressors with names like Sullair, Hurricane boosters, and Belaire. See all the air compressors, portable or industrial compressed air, high pressure, or ultra high pressure, at our website compressedair.ringpower.com.